If you’ve come to Lucy the Baker for plain old sugar cookies, you’ve come to the wrong place. There are no plain sugar cookies here. Yeah, I’ve got cutouts (dazzled with royal icing and a hint of lemon), brown sugar ones that taste like cinnamon, and I’ve got pinwheels, but no regular old sugar cookie. The thing is, sugar cookies are my least favorite. They are so BASIC. Ugh, like so plain with nothing really going on. There is so much potential in a sugar cookie to become something more than what I consider a sugar coated blob of butter. I actually had a bad experience once with a snickerdoodle that tasted just like that. Scarred for life, to be honest. It’s also what I’m trying to avoid, and why you won’t find a snickerdoodle or plain sugar cookie recipe here (for now…. never say never). Now, you might be thinking; “but Lucy, confetti cookies are still plain sugar cookies.” That’s where I’ll stop you. 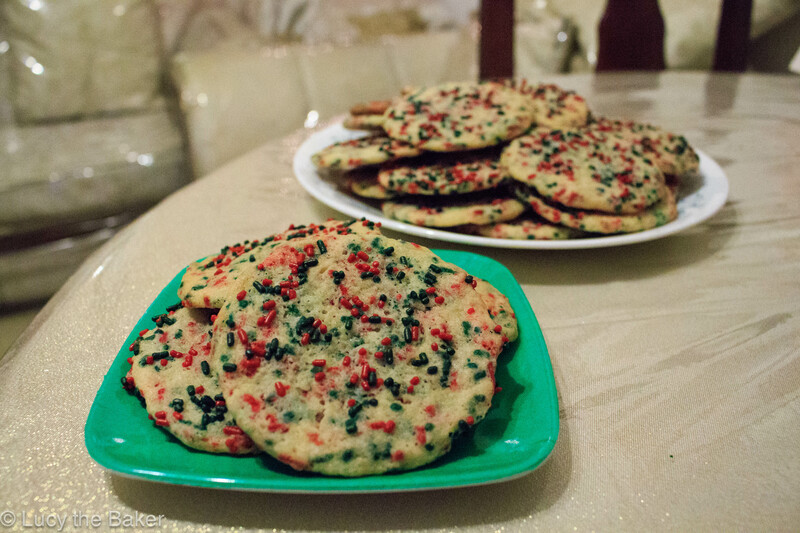 Confetti cookies are sugar cookies on steroids. I mean, it’s sugar on more sugar! I can’t hate on that. Why are confetti cookies different than plain old sugar cookies? They just are. I’m aware that sprinkles (or jimmies to some folks) don’t taste like much or “add anything” to a recipe but I think they do. They add festiveness (in this case), decoration, and they’re just plain fun. Like, do you even consider a plain sugar cookie to be fun? I don’t think so. Besides, sugar cookies have to be adorned or decorated with something more, whether it’s icing or chocolate, to even become likable. Sprinkles are the best and easiest route, so I went with that. I saw this recipe on the amazing Joy the Baker‘s site when her newest cookbook, Homemade Decadence, came out. Consequently, it was also the same day her new page layout went live. Her site is bright and colorful (like she is), which matched these cookies. I’m a sucker for anything with sprinkles, so I knew these were going to be in my future for sure. Since December is basically National Cookie Month, I planned them to be a part of my #CookieCraziness. One of the best parts about this recipe is that you can make the dough a day ahead. I’m not one to make things ahead of time, so I was intrigued into trying it. It made my life so much easier because I basically just preheated the oven, portioned the dough, put them on the sheet and baked them. That’s it! The only sucky part was photographing the making of the dough. It was late and the lighting was off. I felt slightly defeated but I rolled with it, and I think the photos came out okay. Since I wanted to make the dough ahead, I ran into some poor planning. I completely forgot to take out a stick of butter! You can’t really make anything with cold butter. The solution? Cutting the stick into tiny cubes, and spreading them out on a plate. I’m sure it’d work if you piled the cubes in a bowl but I’m really picky about these things. I spread my tiny cubes out on a plate, and made sure none of the cubes were touching. I came back in like 10 or 15 minutes to room temp, soft butter. This is honestly the best way. The microwave can backfire on you (ahem, melted butter), and putting a stick of butter in my pocket just won’t end well. Needless to say, these cookies were awesome. 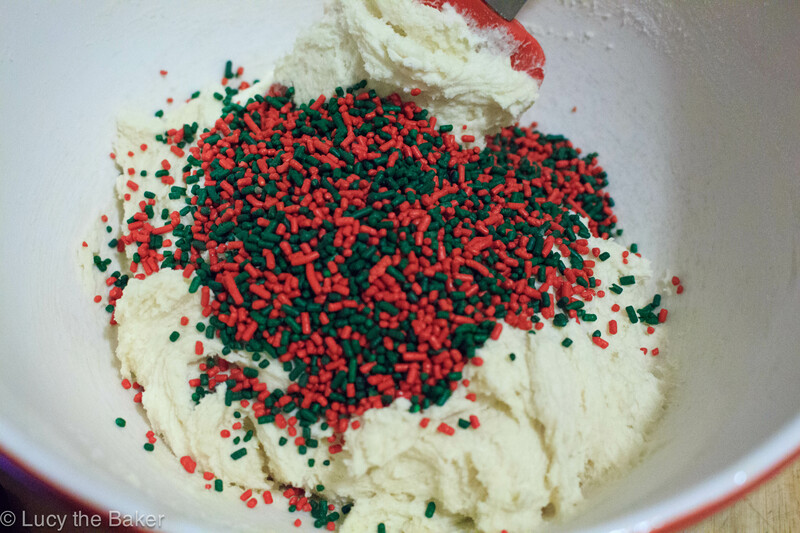 I picked the red and green sprinkles for obvious reasons. I also accidentally poured in the whole half cup into the dough, realizing that I only needed to put in half right after I emptied out the measuring cup. I don’t think it harmed the cookie at all! They were crispy, with a little crunch from the sprinkles. Even with all the sprinkles in the cookie, I dipped them in more sprinkles. More the merrier, right? I hope you now realized that plain sugar cookies are lame, and that confetti cookies are where it’s at. 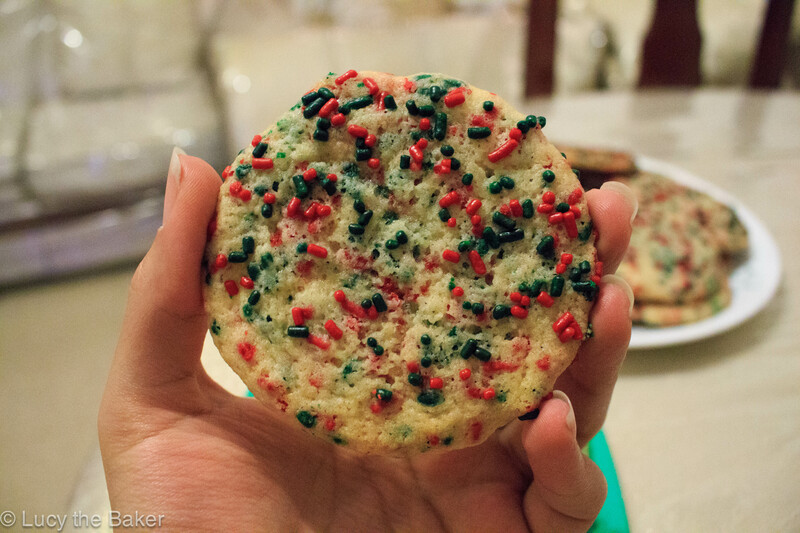 Who would ever decline a fun, festive, and sprinkly cookie over a plain and unadorned one? No one, that’s who. 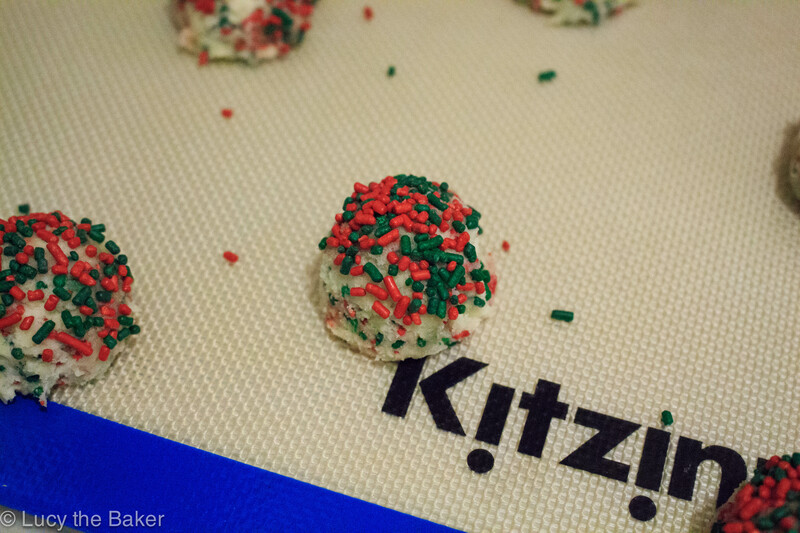 Keep sprinkles in your pantry and dazzle your cookies every once in a while! In a medium sized bowl, whisk together the flour, baking powder, cream of tartar, baking soda and salt. Set aside. Line two baking sheets with parchment paper. In a large bowl, cream the butter and sugar together until light and fluffy. Don’t be afraid to cream the sugar and butter longer than you think! Ideally anywhere from 3-7 or 10 minutes. Add the egg and vanilla extract, and mix until well incorporated. 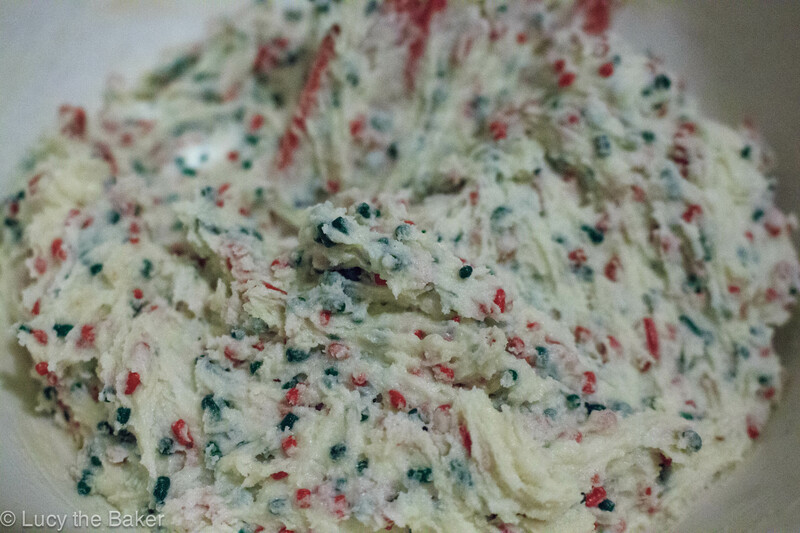 Fold in 1/4 cup (or all of them) of sprinkles into the batter. At this point, you can wrap and chill the dough or portion and chill the dough on the baking sheets. Either way, chill it for two hours or overnight. Preheat your oven to 350F. Take out the chilled dough and portion, if you haven’t already into tablespoon sized dough balls. 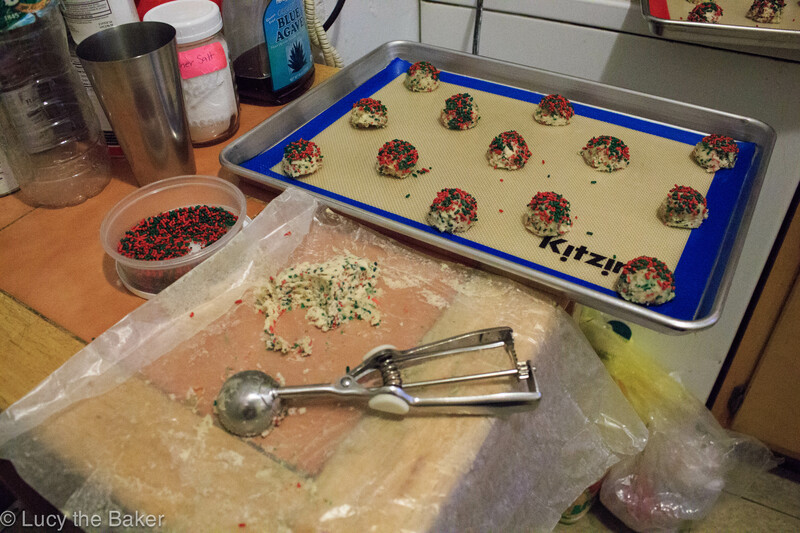 Drop the dough balls into the remaining 1/4 of sprinkles, and placed on the prepared sheets. Alternatively, if you decided to portion and then chill, roll them in the sprinkles before hitting the fridge. Bake the cookies for 8-10 minutes, or until they start to get slightly golden around the edges but are still pale. Cool on the sheet for at least 5 minutes before transferring to a wire rack to cool completely. My cookies spread out and flattened as they baked. This may have happened for a number of reasons. Either the dough got too warm, or the liners and sheets I used were to blame. For the record, I used standard aluminum half sheets lined with silicone liners. Darker pans and parchment produce a different, darker result. Both are fine but it’s just worth nothing. I do not have vanilla beans (sigh) so I stuck with extract. Should’ve liqoured them up, to be honest. We like jimmies here, so I used that. Feel free to use whatever sprinkles you have on hand. Go check out Joy’s blog if you haven’t already, and then weep at the magic inside her cookbook.